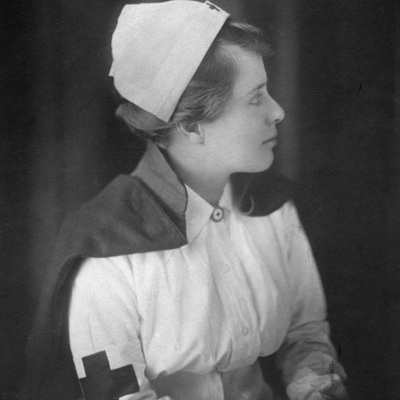 Katherine Olmsted (class of 1912) began her work with the Red Cross as part of a commission of doctors and nurses sent in August 1917 to Romania by way of the Trans-Siberian Railway to fight typhus and study health conditions. Olmsted's public health nursing included conducting clinics and an outpatient department for women and children from a military hospital along the Eastern Front. This group was forced to evacuate in March 1918. Trapped between the German Army and the Russian Revolution with no outside contact, they escaped from Russia by train through Siberia and Lapland before sailing to England in April 1918. Olmsted also led postwar reconstruction work at the League of Red Cross Societies in Geneva, Switzerland. In 1921, she became the Associate Chief of the Department of Nursing and Director of Public Health Nursing, and in 1922 Director of the Department of Nursing, where she continued Alice Fitzgerald’s work to form public health nursing organizations worldwide. She organized a course at Bedford College at the University of London for public health nurses from all over the world. She retired from the Red Cross in 1927, took a Cordon Bleu cooking course at the Sorbonne in Paris, and opened a French restaurant in upstate New York. Olmsted received numerous medals during her nursing career, some of which are included in the gallery below.